An old Patsy Cline song spoke of "walking after midnight" which is cool and even poetic, but the reality is that those among us who dare to walk or ride a bike after darkness falls can be risking their very lives if they are not properly equipped. Lack of visibility is one of the leading causes of pedestrian and cyclist fatalities in the United States. Other factors, such as road and weather conditions, come into play as well, but equipping riders and hikers with the proper safety apparel is one pro-active measure that can greatly help to reduce the odds. Lumenus outerwear is a performance lifestyle wearable technology brand, which represents a collaboration between accessories maker, Outdoor Tech and designer, entrepreneur and outdoor enthusiast, Jeremy Wall. Although still in pre-launch mode, Lumenus is destined to become the next wave of smart clothing and wearable technology products. It promises more visibility to bikers and pedestrians than any other product on the market today. 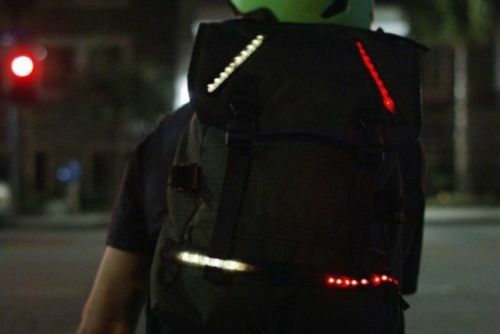 The line includes two jackets, a vest and a backpack embedded with customizable LEDS, which the wearer can illuminate when desired. A young man of extreme passion and accomplishment, Jeremy Wall is a modern explorer always open to discovering and developing new skills and technologies as they apply to industry, business and product development. His love for the outdoors is at the crux of all his creative efforts. Los Angeles-based Outdoor Tech caters to mobile technology and the dynamic needs of combining a modern lifestyle with the desire to enjoy the great outdoors. Unspoken is the need for humans to connect with one another but still be free to roam at will. Space for this innovative company is defined not by that which confines them but rather by the unlimited, eternal boundaries of personal imagination and inspiration. The idea behind Lumenus outdoor gear is ultimate safet, as retro-reflective clothing can render bycyclists more visible at night. The practical and fashionable garments are equipped with both Android and IOS. 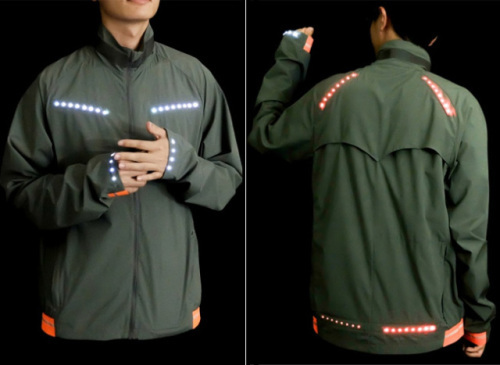 The water-proof garments are powered by batteries that can last up to one full day and the LEDs, when coupled with a GPS and a mapping technique, can be configured to function automatically. Lumenus garments are made with some of the highest end performance textiles on the market today. Their ZeroUI Bluetooth Low Energy and washable LED system makes then practical as well as ultra cool. The company has launched a Kickstarter campaign with a goal of $54,000 to boost production. These special garments are slated for shipment in June of 2016. Be safe when you ride your bike at night and why not be cool too? Do you see 'safety-related apparel' as a continuing trend or a flash-in-the-pan? Win A Galaxy Nexus Tablet & Much More In The Instructables Holiday Contest!